FRUITS & VEGGIS – First of all the produce is organic and they don’t need to create special labels for me to know. Folks from villages all have their own gardens and what they don’t use themselves they sell in the cities and towns. Small farms do the same and the food is always fresh. I can buy a whole carton of strawberries for 2.50 BGN ($1.66), which would probably cost me $5 in the U.S.
BANITZA, is a term used by Bulgarians for a flaky pastry. Macedonians refer to it as Vielnik, Masnik, or a more loosely as Pita ( Cyrillic: Баница, also transliterated as Banica and Banitza) is a traditional Bulgarian and Macedonian pastry prepared by layering a mixture of whisked eggs and pieces of sirene (feta cheese) between filo pastry and then baked in an oven. In the fall Pumpkin Banitza is Amazing! CHUBRITZA – ( Bulgarian, Чубрица) is the name of a Bulgarian table spice which is similar to savory. Its extremely yummy! Chubritza plays an important role in Bulgarian cuisine, providing a strong and pungent flavour to the most simple and the most extravagant of dishes. When mixed with salt and paprika, it is called sharena sol (also love!). SIRENE or CERENE (Bulgarian: сирене) is a type of white brine cheese made in Bulgaria, similar to feta cheese. This is a very popular Bulgarian cheese, usually made with a combination of sheep and cow milk. It is very soft, with a fat content of 40-45%. It is commonly produced in blocks, and has a slightly grainy texture. Sirene has a fresh lemony taste. It is used as a table cheese, as well as in salads and in baking. **But, lets not dwell on names but more importantly on the fact that this Lactose Intolerant American can eat fresh cheeses here in Bulgaria with no problems (and I’m not the only one). I believe my “lactose intolerance” is really an intolerance to the way dairy is pasteurized and processed in the United States. I will miss being able to eat it everyday with no worry. LUTENITSA (lutenitsa or lutenitza, Bulgarian: лютеница) – I almost made the mistake of buying this instead of tomato sauce at the grocery store when I first arrived, since the packaging is very similar. Lutenitsa is a spread made from tomatoes, peppers, onions, garlic, black pepper, vegetable oil, sugar and salt. Some types have a pleasant chilli taste. It may contain eggplant puree as well. It is mainly used as a spread on bread, sometimes sprinkled with grated white Feta cheese and its delicious with Eggplant and potatoes. 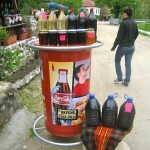 MAVRUD – is unique red wine common only for the region of Thrace in Bulgaria. It is the only red wine I have ever truly enjoyed. In the States red wine typically gives me headaches, but here in Bulgaria! TRAMINER – is a white wine unique to the Black Sea region of Bulgaria where 30% of all vines are located. It is a sweet white (which you all know I love ;p), similar in taste to a muscat but dryer. The traminer grape is similar to a Sauvignon blanc grape. RAKIA – The drink rakia or rakija ( Bulgarian: ракия, Serbian, Croatian and Bosnian: rakija) is hard liquor similar to brandy and vodka, made by distillation of fermented fruits, popular throughout the Balkans. Its alcoholic contents is normally 40%, but in home-produced rakia it can be higher, typically 50 to 60%. 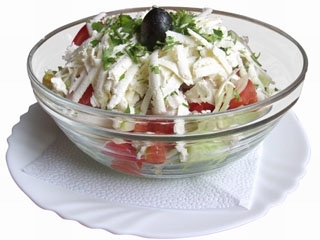 We usually call homemade Rakia “Grandfather Rakia.” It is often drank with Shopska Salata (see below). 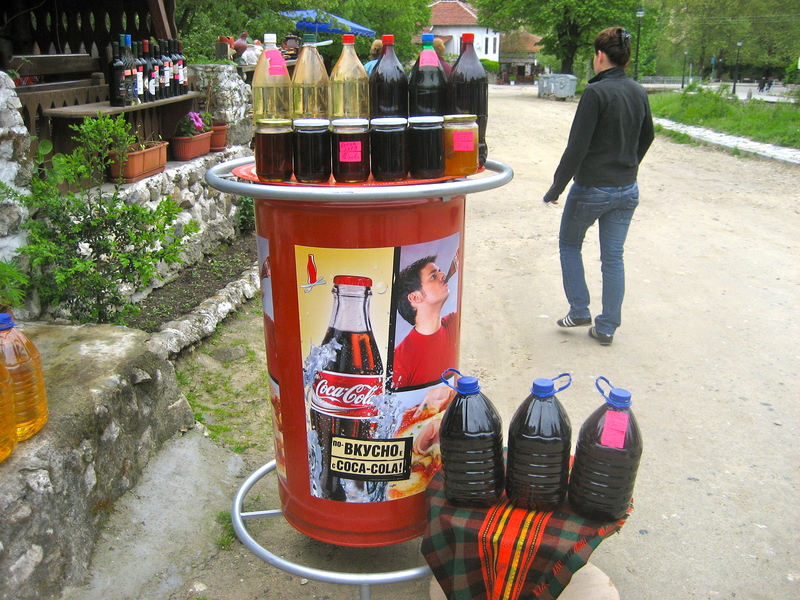 GRANDMOTHER WINE – This is homemade wine often made by grandmother’s who then will sell it on the side of the road in old soda or water bottle containers. The best “Grandmother Wine” I had was from my hostel host’s grandmother in Lake Ohrid, Macedonia. SNEJANKA SALATA (снежанка салата) – Also known as Milk salad or Snow White’s Salad is made of strained yogurt, cucumber, and garlic. BULGARIAN YOGURT – In Bulgaria yogurt is called “кисело мляко” (kiselo mlyako), which means “sour milk”; in Serbia, yogurt is also called “кисело млеко” (kiselo mleko), while Serbian yogurt is a thick, milky liquid produced by fermentation of milk. Bulgaria is very proud of their special Bulgarian bacteria used to produce the country’s yogurt. It tastes the best with homemade jams which you can buy right off the street from a grandmother or produce stand for 2-4 BGN. I just bought a homemade fig jam in Melnik and it tastes amazing. MOUSSAKA (Greek: moussakas; Romanian: musaca; Turkish: musakka; South Slavic мусака / musaka; Arabic: musaqqa a) is a traditional aubergine (eggplant)-based dish in the Balkans and the Middle East. The Greek version consists of layers of ground (minced) lamb, sliced aubergine, and tomato, topped with a white sauce and baked. In the Arab world, moussaka is a cooked salad made up primarily of tomatoes and aubergine, similar to Italian caponata, and is usually served cold as a mezze dish. Despite its Arabic name, moussaka is usually thought of as a Greek dish in the West. The Bulgarian, Serbian, Bosnian and Romanian versions are made with potatoes instead of aubergine. 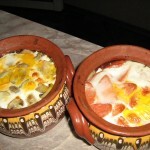 GUVECHE – A traditional Bulgarian dish prepared in a clay dish of a similar name. 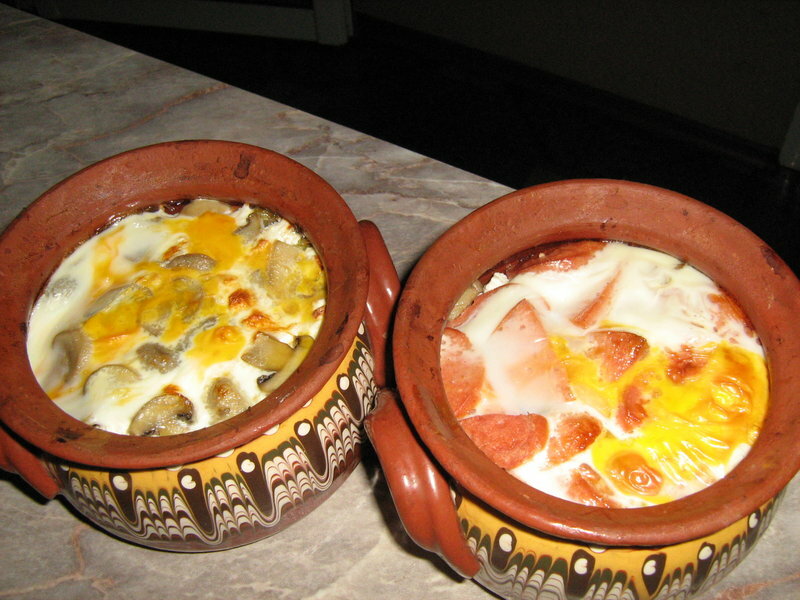 Typically made with sausage, various vegetables of your choice, mixed with cerene “white cheese” and an egg cracked and on kashkaval “yellow cheese” on top. Its then place in the oven to bake. I usually make it just with broccoli, onions, peppers, potatoes, and sometimes chicken. Its so easy and the smaller clay dishes are perfect when you just want to cook dinner for yourself.